Last Thursday we had our Little Flowers Girls' Club meeting on St. Frances Xavier Cabrini and the virtue of Industry. Once again, since the weather was gorgeous, I hosted the meeting at my home in the afternoon, giving the girls an opportunity to have some play time in addition to our meeting. As usual we began our meeting with the prayer to St. Therese and the Acts of Faith, Hope, and Love. We then continued with a review of the virtue and saint we learned about at our last meeting. I printed out Charlotte's St. Frances Xavier Cabrini Coloring Page to color, and then be added to the girl's notebooks. Next I introduced the virtue we will be working on, Industry, and read a short biography of the saint for this month, St. Frances Xavier Cabrini. *YES!! I spelled "Frances" incorrectly, and didn't notice until after the meeting... Oops! The girls have gotten so industrious at putting their pages together, and they were done in no time! Snack time was next. Dee Dee had snacks for this meeting, and she did a wonderful job! She made the cutest Daffodil Cupcakes using Wilton Flower Silicone Fun Cups and Charlotte's Daffodil Cake recipe. The girls loved them! Before the girls all headed out to the swing set to play I snapped a quick group photo. I was so excited to see that everyone remembered to wear their sashes this time! 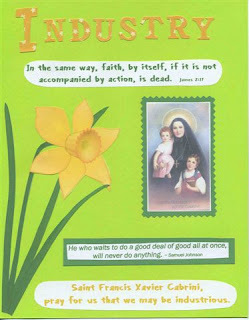 Saint Frances Xavier Cabrini, pray for us that we may be industrious! Another home run for you Mom! It all looks so fabulous! I have been to her shrine in CO. when I was at Youth Day and long long time ago already! 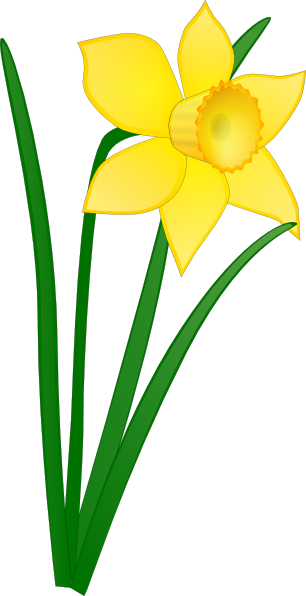 I enjoy your Little Flowers Girls' Club posts. I think it is such a beautiful thing! I'd love to find one close by (or start my own??) with my girls ... Do you know where I could get more info? Is there a general Web site or something? Thanks! Oh, thank you, Jessica! I will check it out! The daffodil cupcakes look so yummy. If you and your pals host a cookery show on TV, I'm sure its gonna be an instant super-hit! Best of Luck and God bless all of you.